Okay, I’m biased, but Cato stood up against the so-called stimulus when others were quiet. Cato was against Obamacare, even back when it was called Romneycare. Now, we’re leading the fight on restraining Leviathan. 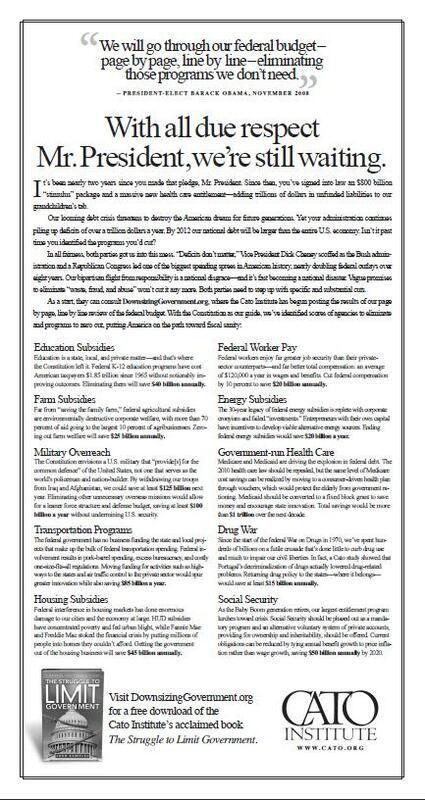 The image below is our new full-page ad on cutting wasteful programs, agencies, and departments – and asking Obama to fulfill his promise on reducing needless spending. Click here for a full-size version. And check out the Downsizing Government website put together by my colleague Chris Edwards. Is the Tea Party Movement a Net Plus for America? Steve Chapman points out that the Tea Party movement (like any other large group of people) has a few odd characters, but he is delighted that there is a growing mass of citizens who think it’s important to restrain government and not impose burdens of future generations. Here’s my first impression of the tea party movement: It’s a rabidly right-wing phenomenon with a shaky grasp of history, a strain of intolerance and xenophobia, a paranoia about Barack Obama, and an unhealthy reverence for Fox News. Any movement that doesn’t firmly exclude Birchers, birthers, and Islamaphobes is not a movement for me. Here’s my second impression of the tea party movement: We are lucky to have it. That’s because the tea partiers, who may not all agree on gay marriage or birthright citizenship, are united behind a couple of sound goals: curtailing the cost of government and refusing to live at the expense of future generations. Those are goals that, for eight years, had many rhetorical supporters in Washington, but few authentic champions. Blame that on George W. Bush, who arrived billing himself as a compassionate conservative, a description that was accurate except for the adjective and the noun. Whatever his ideology, his policy was to expand federal spending at a rate unseen since President Lyndon Johnson, the architect of the Great Society. He didn’t do it alone, though. Had Bush been a Democrat, Republicans would have fought his budget plans at every turn. But since he was one of theirs, they joined in the spree with gusto, even as they cut taxes and piled up deficits. The prevailing attitude was: Live it up now, and let someone else worry about paying for it later. Budget hawks were left wondering what happened to Republican tightwads, who thought every dollar spent by the government was a dollar that had to be justified as a vital necessity. The tea partiers were dismayed to see these penny-pinchers replaced by poll-driven insiders with an appetite for earmarks. That’s one big reason hard-right candidates have scored so many upsets in recent GOP Senate primaries—including Rand Paul in Kentucky, Sharron Angle in Nevada, Joe Miller in Alaska, and Christine O’Donnell in Delaware. They didn’t get nominated because they look and sound like the popular image of a savvy, experienced, well-informed, practical-minded U.S. senator. They got nominated because they don’t. I don’t know if this is hope or change, but the United States fell from 2nd to 9th in the Forbes index of “Best Countries for Business.” Denmark is first, which may be a surprise, but the Scandinavian country is very free market other than fiscal policy. Hong Kong, meanwhile, enjoyed the biggest increase. The U.S. economy is teetering on the edge of a double-dip recession. High unemployment and a weak housing market are dragging down economic growth. But there’s another major issue that isn’t getting much attention these days: The business climate for entrepreneurs and investors in the U.S. is starting to lag behind other countries’. The U.S. dropped from No. 2 to No. 9 in our fifth annual ranking of the Best Countries for Business. Blame the high tax burden and a poor showing on trade and monetary freedom compared with many other developed nations. The 35% federal corporate tax rate is the highest of any OECD country according to the Tax Foundation. Meanwhile the government’s significant intervention in the economy during the economic downturn has weakened economic freedom in the U.S. …A big mover up the rankings is Hong Kong, which swapped places with the U.S., moving up to No. 2 from No. 9. It scored in the top three for taxes, investor protection and both trade and monetary freedom.